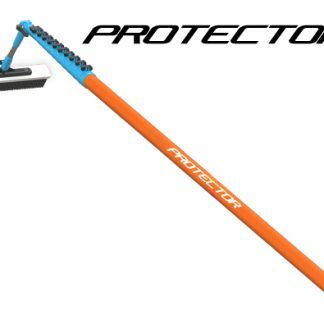 The Quattro is the best point of use system for a wide variety of Window, Solar Panel and Hard Surface exterior cleaning applications. The tough, compact design and ease of use makes the Quattro the number one choice for work in any area where both mains water and electricity are available (a generator can also be used). Window Cleaners make use of the Quattro to access remote parts of modern buildings such as court-yards and roof tops for atrium cleaning. High-rise buildings where suspended platforms are used as well as the abseiling technique also benefit from short waterfed pole cleaning from rooftop Quattro use. On-site building maintenance teams also use the Quattro for in-house window and façade cleaning duties as well as spot-free car washing. The Quattro ‘S’ model is designed for high performance in the Worlds most demanding environments. Plastic filter housings may be prone UV degradation and to failure in temperatures above 30C. The ‘S’ model features high-pressure stainless steel filter housings that can withstand temperatures in direct sunlight of up to 50C. Because the pressure is boosted even further, the QuattRO ‘S’ can be used by several operators up to 80ft. The Quattro™ – is available in three configurations. 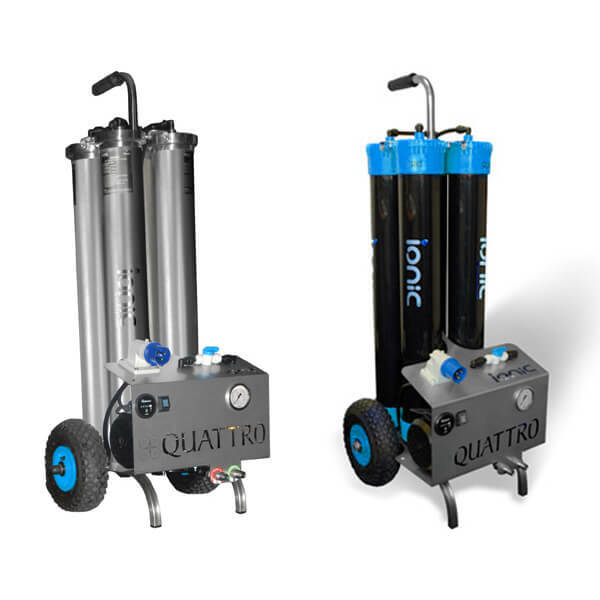 The standard Quattro System works from water pressure alone (min 60psi), and is suitable for a single operator to use at lower levels. Carbon Filter, Removes Chlorine, protects RO membrane. 5 Micron Filter – Removes impurities larger than 5 microns. 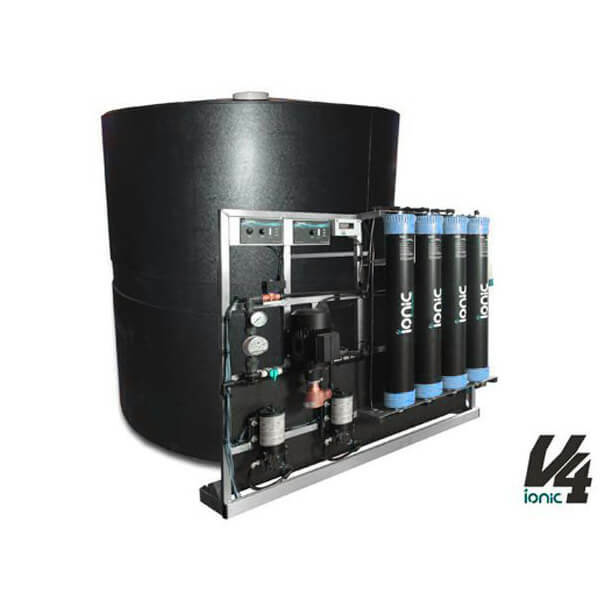 RO Filter- Mechanically filters water rejects up to 98% of remaining impurities. 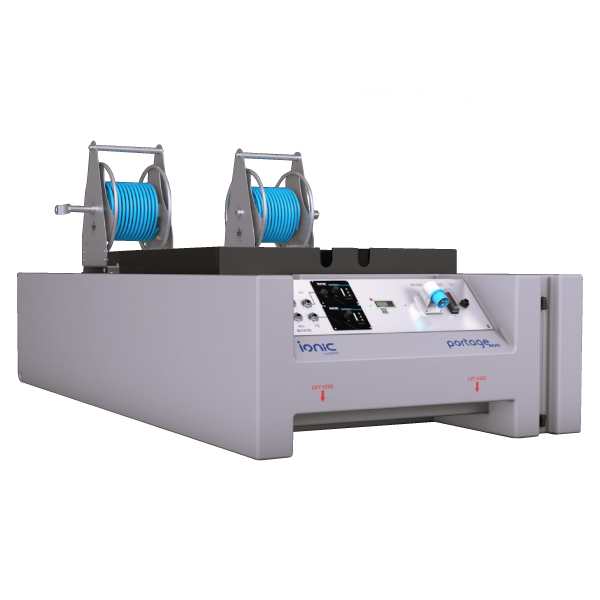 DI Filter – Polishes water to zero parts per million purity. In hard water areas an in-line water softener is recommended to remove harmful calcium. If not removed from the water supply calcium causes poor performance and premature failure of the RO filter membrane.